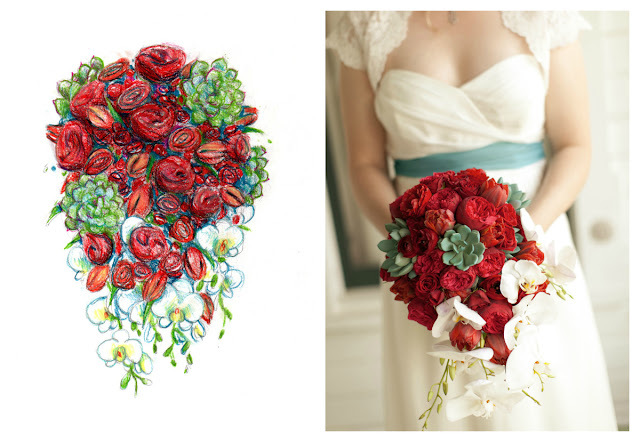 Pin It Did you see this bouquet on our Facebook page yesterday? What was your guess? How much does it cost? This one was created by STEMS Floral Design. Read on! At STEMS, they work with you to create your vision of the perfect bridal bouquet. For Katie, this was it. So now that you've seen the concept and the creation, let us show you how they got there. Brandon L. guessed $528, and Amanda P. guessed $530 on FB yesterday. They were both incredibly close! 15 red garden roses at $7 per stem. 2 bunches of red ranunculus at $30.00 per bunch. 15 stems of red parrot tulips at $4.50 per stem. 5 turquoise succulents at $9.00 each. 3 stems of white phalaenopsis orchids at $34.00 each. The total cost of this bouquet is $529.36. It's important to us, for you to really understand the process before even getting to the point of physically creating this bouquet.... which all too often gets overlooked. The florist typically meets with clients on average 1-2 times to help develop the look and feel of what we are creating for the wedding. Each consultation typically lasts between 1-3 hours. Putting together each proposal takes on average 3 hours. In that 3 hours, STEMS creates custom inspiration boards that give a clear picture of what they are proposing along with written descriptions that describe everything down to the last detail. The inspiration boards have pictures of every item they will be making, and often include detailed sketches that offer a fun glimpse at what's ahead. Putting a number of the amount of emails and phone calls would be difficult to say the least. There are no limitations on how often you can consult with the STEMS designers, and with them, you have at your disposal the combined knowledge of 15 years worth of experience and five designers. STEMS often does walk throughs, again complimentary, with clients (and often your Fairy Godmother if that is part of your package) at venues to make sure everyone is on the same page. NOW it is time to make the bouquet—a total of 68 stems in this bouquet and over 100 actual blooms, which took the designer about an hour and half to make. The end result is stunning and always worth every minute of planning when we see the bride's reaction. The STEMS team absolutely loves what they do and are so glad to help shed some light on the process of floral design and the costs involved.